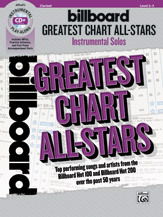 Billboard Greatest Chart All-Stars Instrumental Solos contains hit songs from the Billboard Hot 100 and Billboard Hot 200 lists of the past 50 years. Each instrument book is carefully edited, complete with articulations, dynamic markings, and keys well suited for the developing player. The accompanying MP3 CD includes a live instrumental performance of each song followed by a play-along track, PDFs of piano accompaniments, and Alfred's TNT 2 practice software.